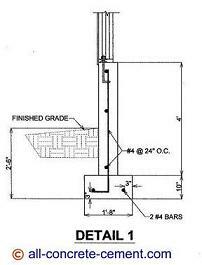 Continuous footing, wall footing, strip footing, and spread footing, all refer to the same type of footing. Since these footings are very similar, their footing design process are understandably the same. Shown on detail 1 below, is a cross section of these footings which are typical at perimeter of the house plan shown here. Since this house is exposed to freezing temperature, they must be built below the frost line, in this case it is 30 inches or 2'-6". In the event of an earthquake or hurricane, a properly designed and constructed footings provide the necessary counter balance forces that enable a house or a building to withstand the destruction forces of nature. Their massive strength and weight is the reason shear walls and braced frames are anchored by footings that are continuous. 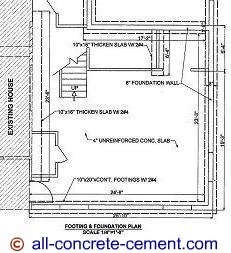 Shown as dash lines in the perimeter of the house addition plans below are these footings. They are linked together so that they can work as a unit. Similarly, the exterior walls on big warehouses and department stores such as Walmart and Home Depot are all built on continuous footings. Since such building covers a wide area, the roof has to be supported with spot footings at the interior. That's the reason for the exposed round steel tube or square steel tubing posts or columns at the interior of the building. At areas where deep foundations such as drilled caisson or piles are required, another form of continuous footings called tie beam is used, see detail 3. Tie beams run continuous between the caissons and they are designed and constructed just like a concrete beam. Not shown on detail 3 are the stirrups or ties that runs across the tie beam in the short direction or perpendicular to the longitudinal rebars that shown top and bottom. The Caissons can range in diameters from 18 inches to 12 feet. The depth varies from 40 feet to more than 200 feet depending on soil engineer's recommendations. After the caisson is drilled and poured, a pile cap is constructed on top as shown prior to the tie beams. These tie beams has the same function as footings that are continuous. The structural elements such as foundation walls, columns, braced frame, etc are constructed on top of pile caps and tie beams. Toward the tail end of 2009, our company completed a 600,000 square feet 4 story building where thousands of drilled caisson were used for footings. As the project engineer in charge of that project, it was amazing to see how the design and the construction teams came together to accomplish such an incredible structure. Houses with basements are also built on footings that are continuous. Detail 1 can also be used for basement only the foundation wall will be 8 to 10 feet high. The reinforcements and thickness of wall may be different depending on engineer's recommendation. Some custom homes can go up to 40 feet high, the deepest foundation wall that I had seen was 60 feet, the owner wants a basket ball court at his basement. In addition to supporting walls, continuous footing is where house or office building is anchored. For residential construction a hold down or a strap prevents the house from tipping over in the event of high wind and/or earthquake. Below those hold downs are footings that are continuous. Commercial structures are the same way, next time you see a steel cross brace in any office building, below that brace is a reliable footing that is continuous and heavily reinforced with rebar. Forming continuous footing is one way to save on your concrete work. Click here. to learn how to save on your footing form work material.